From best-selling author G.P. 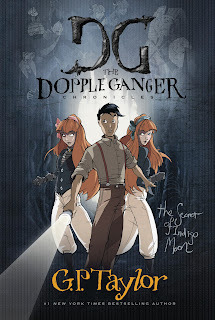 Taylor comes the highly anticipated second installment of The Dopple Ganger Chronicles, a series that combines art and traditional text to help “reluctant reader” discover the wonder of books. Erik Morissey Ganger, famed explorer and detective (well, in his dreams, and his mischief-making sidekicks, twins Sadie and Saskia Dopple, didn’t go looking for a secret tunnel beneath the school. They never intended to make acquaintance of a shifty private eye with a nose for trouble. It wasn’t part of the plan to come face to face with an old enemy, one with an agenda of his own that could destroy them all. And unraveling the “secret of indigo moon” was the farthest thing from their minds. At Isambard Dunstan’s School for Wayward Children, these things just seem to happen. IN the Secret of Indigo Moon, confirmed troublemakers Erik, Sadie and Saskia plunge headlong into a new and perilous mystery, one that challenges everything they thought they knew about their lives, themselves, and who it’s safe to trust. I must say right up front I am not a big fan of graphic novels. Because I’m always trying to find ways to get my students to read; and because my students love graphic novels, I decided to give this book a try. I am glad I did. For me so many graphic novels are more pictures than words. This series has a great balance of both. This is the second book in the Dopple Ganger Chronicle. Erik Morissey Ganger and twins Sadie and Saskia Dopple find themselves once more in the thick of things. They have another mystery to solve. In this book they must face a enemy they met in the first book “The First Escape”. With the help of Madame Raphael they may just have a chance of surviving and solving the mystery. This series will go on my shelves and I will talk it up and recommend it to all of my students.